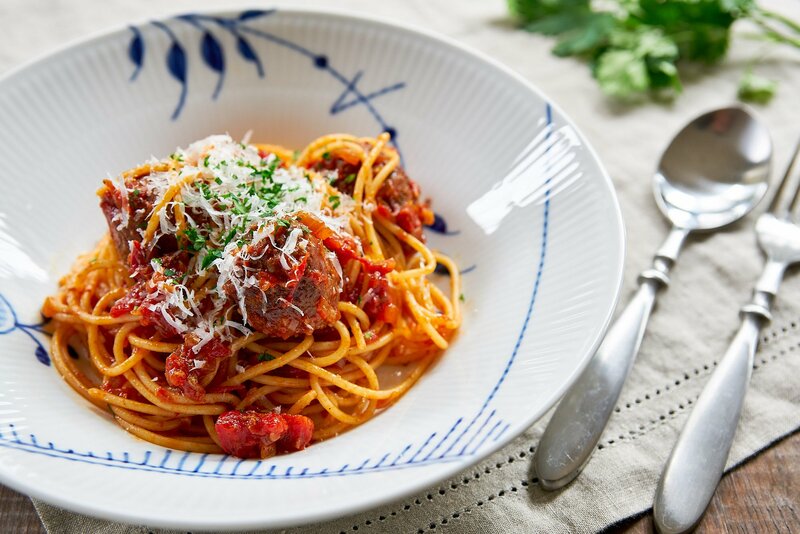 This Italian-American favorite pairs tender, juicy meatballs with long strands of spaghetti and a simple sun-ripened tomato sauce for the ultimate spaghetti and meatballs. 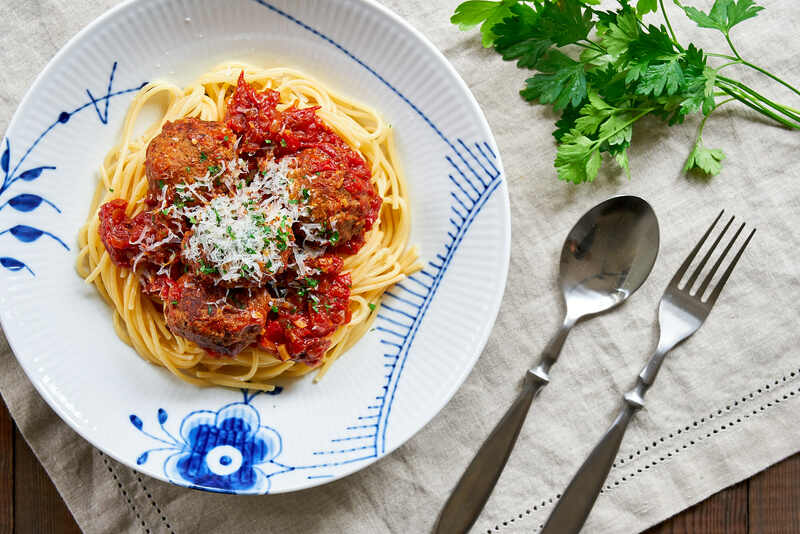 With the mercury falling faster than a drop of rain, I decided to bridge the gap between summer salads and winter braises with these comforting meatballs. The last batch of tomatoes ripened under the waning summer sun sat waiting on my counter, and I couldn’t think of a better use for them than to make a simple tomato sauce to go with these marvelous meatballs. I’ll tell you right now that if you’re looking for a quick pasta dish, this isn’t it. Bookmark this dish for a weekend project and go check out my spaghetti with meat sauce recipe. It all started when my lazy Sunday supper took a turn from an improvised dinner to an exercise in measuring, documenting, and photographing. It’s a process I always go through when developing a new recipe for this blog but it’s one I’d hoped to avoid that day. Thankfully all that effort was not spent in vain as this is the best spaghetti and meatballs I’ve ever made! Now words like “best” are so subjective I should probably qualify it with what I value in a good meatball. For me, meatballs should be melt-in-your-mouth tender yet chock full of meaty flavor. Gently kissed with the verdant flavor of herbs and coated in a sweet sun-ripened tomato sauce, meatballs should be juicy without being greasy. So how did I make these orbs of meaty goodness you ask? Here’s my play-by-play on how I engineered these ultimate meatballs. I don’t think there is any doubt that caramelized onions taste better than raw onions, the question is whether the extra effort is worth it. In my experience meatballs with caramelized onions taste better than meatballs made with raw onions. However, if you’re pressed for time, you can get away with putting the onions and garlic in a safe microwave bowl, cover them with a lid, and steam them in the microwave until they are tender. You won’t get quite as much flavor out of them as sauteeing them in a pan, but it’s far less work, and it still brings out the sweetness of the aromatics. All beef or a blend? This is going to be a matter of personal preference. 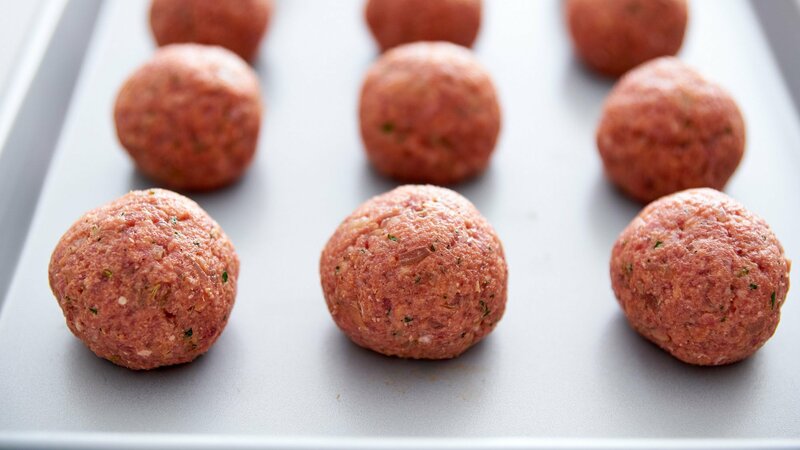 Meatballs made with all beef have a darker meatier color and a more beefy flavor, they also tend to be a little more lean, which means they can be a bit drier. By blending some pork into the meatball mixture, you get a better balance of fat, which means the meatballs tend to be juicier. It does make the meatballs a little lighter in color, but you also get a porcine punch of umami that beef alone can’t deliver. Personally, I like using an 80:20 ratio of beef to pork. This still offers plenty of beefy flavors, while providing porky synergies that make the meatball better. 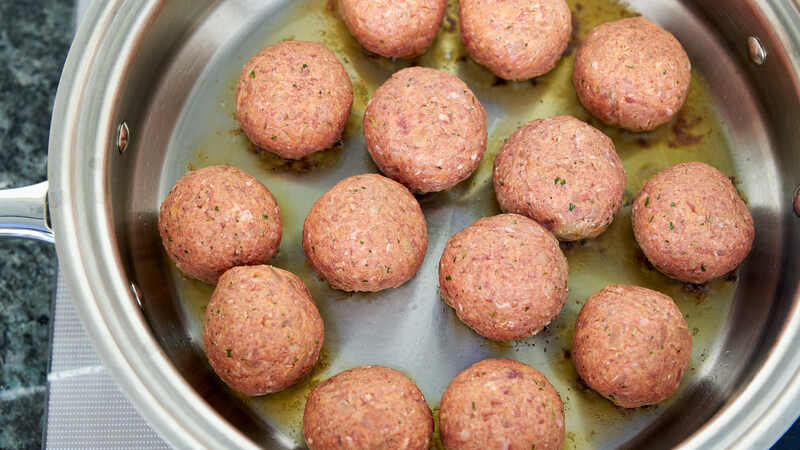 Cheap fillers like breadcrumbs, ricotta, or tofu are often added as a way to stretch the meat, but are you just diluting the flavor of the meatballs, or are there some tangible benefits to adding fillers? Perhaps the most common filler is breadcrumbs. They’re cheap, and can significantly increase the number of meatballs you can make from the same amount of meat. But this isn’t just about saving money. Breadcrumbs also aid in the quest to make meatballs juicier. As anyone who has ever dunked a piece of bread in a bowl of soup can attest, bread soaks up liquids like a sponge. As the meatballs cook and the meat releases its juices, the breadcrumbs are there to sop them up so they can gush all over the inside of your mouth as you bite into one. The final benefit of adding breadcrumbs is that they don’t get hard when they’re cooked as meat does. That means the breadcrumbs also help keep your meatballs tender. Ricotta is another common filler that’s added. While ricotta can’t absorb liquids, it does have a bunch of fat, which adds flavor to your meatballs while helping to keep everything moist and tender. Of course, this is also a downside if you’re trying to limit your fat or cholesterol intake. One reasonable substitute I’ve found is soft tofu, which has relatively little fat, and no cholesterol. As long as you don’t add too much, it’s impossible to taste it, and yet it keeps your meatball moist and tender. I like having very flavorful meatballs in a simple tomato sauce. 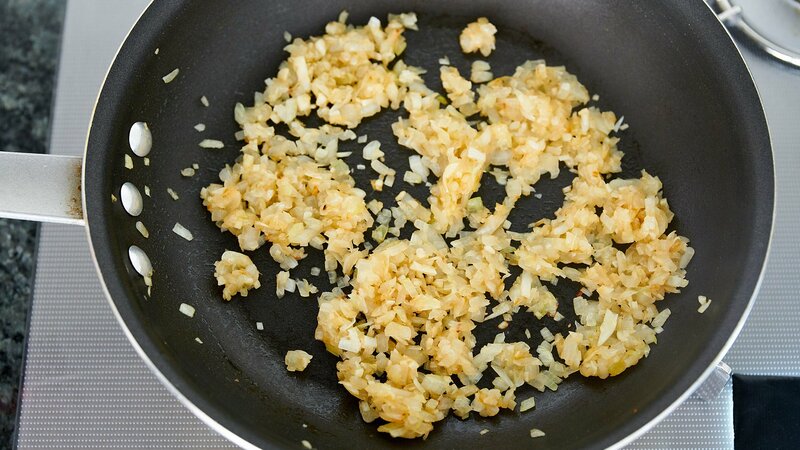 That’s why I add a ton of seasonings, starting with the sautéed aromatics like garlic and onions. Then, I layer on additional umami boosting ingredients such as tomato paste, soy sauce, and Parmigiano-Reggiano. If you want to go nuts on the umami, you could also add some porcini powder to the meatball mix. 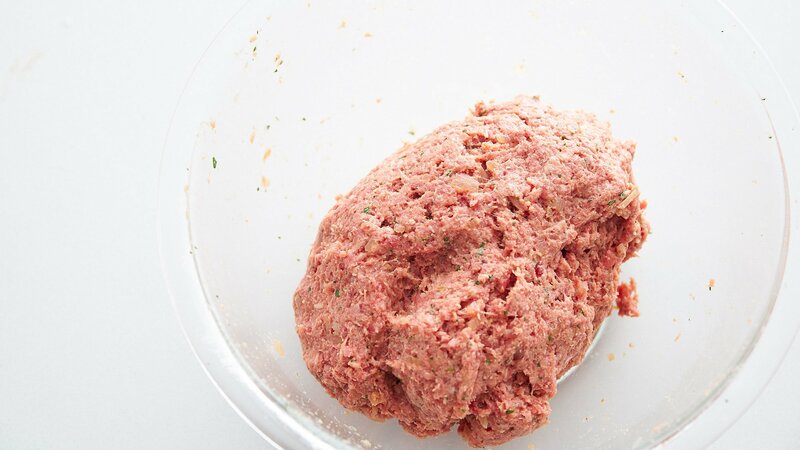 Fresh thyme and parsley, as well as fennel seeds, nutmeg, and black pepper, get added to the meatball mix. The result is an ultra-savory meatball with enough flavor that they’re delicious on their own, but even better once cooked with the fresh tomato sauce. Polpette Grande, Polpette, or Polpettine? This is almost entirely a function of personal preference, and you can make them as big or as small as you want. The bigger they are, the harder they are to handle, and they tend to get flat because of gravity. My personal preference is for meatballs a little bigger than a golf ball. This is an easy size to handle while giving them enough girth that you wouldn’t want to pop a whole meatball in your mouth. If you opt for making marble-sized polpettine, be careful as it is easy to overcook them. We’re still getting the last of this summer’s tomatoes, and for meatballs, I love using fresh sun-ripened tomatoes as the sauce ends up light and mildly sweet. This simple sauce makes for a beautiful contrast to the rich complexity of the meatballs. If the tomato skins aren’t too thick I usually just chop the whole tomato up to save time, but the skins and seeds do make the sauce a bit rustic. If you’re looking to do this properly, you’ll want to peel the tomatoes and remove their seeds. If you do go down this route, be sure to weight the tomatoes after you’ve peeled and chopped them. If tomatoes are no longer in season head over to my Basic Tomato Sauce recipe, which uses canned tomatoes to make a respectably delicious sauce for your meatballs and spaghetti. 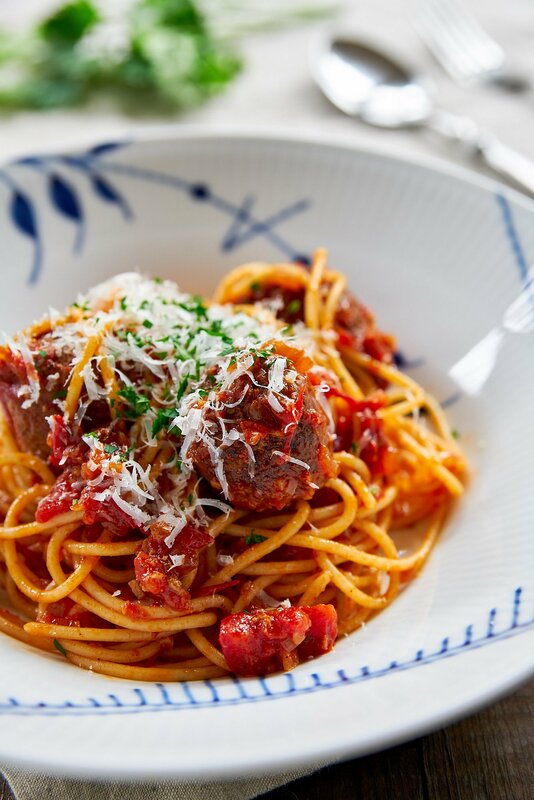 Most of us who grew up in the US think of Spaghetti and Meatballs as Italian as red Ferraris and Chianti, but they’re actually an Italian-American culinary innovation. In Italy, Polpette are served in soup, or as a main (sans the pasta). While it’s unclear who the genius was that first brought these two together, it’s become an enduring part of the Italian-American culinary legacy. Now that we have that out of the way, what’s the best pasta to pair with meatballs? Everyone has their preferences for pasta, and whether you serve these meatballs with tagliatelle, penne or farfalle, you’re still going to have a big bowl of deliciousness. That said, spaghetti is the classic pick, and for nostalgic reasons alone I can’t imagine serving these meatballs with anything else. I mean who can forget that scene in Lady and the Tramp where a shared plate of spaghetti and meatballs blossoms the most unlikely of romances? Baking the meatballs helps retain their shape while allowing you to cook a ton of meatballs in one go. The only drawback is that you don’t get as much browning on the exterior of the meatball. This is why I prefer frying them in a pan as the browned meat juices dissolve into our tomato sauce giving it a ton of flavor. You may notice that the photos show a stainless steel pan, but this is a bad idea as the cheese in the meatballs causes them to stick to the pan like crazy which makes it difficult to retain their shape. In a non-stick frying pan, you can roll the meatballs around with a wooden spoon to evenly brown every surface while keeping them nice and round. Once you’ve browned the meatballs, they need to come out of the pan while you make the sauce. 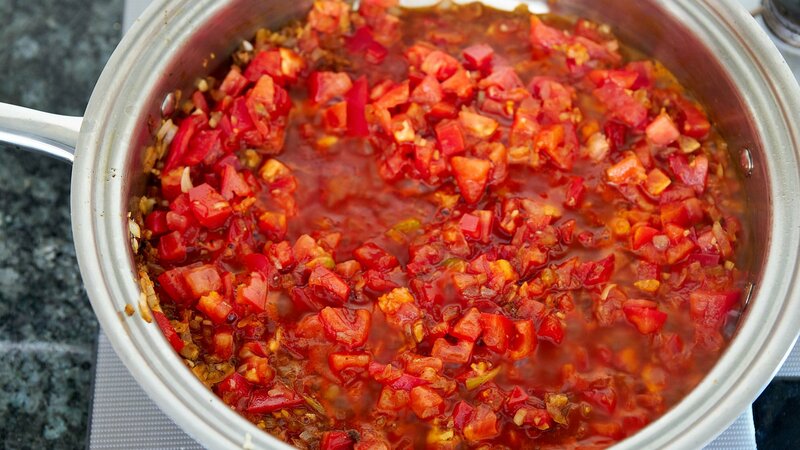 Using the same pan not only saves a bit of work, but it also adds additional flavor to our sauce. After the tomatoes go into the sauce, you return the meatballs to the pan to finish cooking them. This also gives the sauce a chance to draw some of the flavors from the meatballs. For the meatballs, fry the onions and garlic in olive oil until they're tender and starting to brown. Remove the pan from the heat and let them cool. 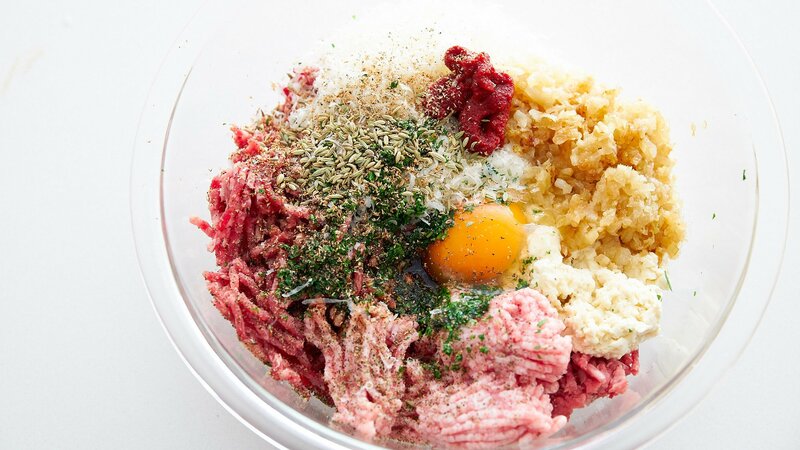 In a large bowl, add the beef, pork, ricotta, egg, panko, Parmigiano-Reggiano, thyme, parsley, soy sauce, salt, fennel seeds, nutmeg, and pepper along with the caramelized onion mixture. Put some gloves on and use your hands to knead the mixture together until all the ingredients are evenly distributed and the meatball mixture is the consistency of bread dough. Use your hands to roll the mixture into meatballs. I like to make about 16 balls that are about 2-inches in diameter. Heat a frying pan up over medium-high heat, then add 1 tablespoon of olive oil. Fry the meatballs in batches, gently rolling them around with tongs to maintain their shape until browned on all sides. Pour off all but 1 tablespoon of oil then sauté the garlic and onions until they are soft. The browned meat juices on the bottom of the pan are where the sauce get's its flavor, so be sure to scrape those up. Add the tomatoes, tomato paste, and salt and bring the mixture to a boil. Boil the spaghetti in salted water according to the package directions. Drain the pasta, then toss the pasta together with the sauce. Plate the spaghetti, then top each serving with meatballs, minced parsley, and parmesan cheese. So scrumptious looking! That is one of my favorite pasta dishes. Gorgeous photos as always… I was thinking about how tender those meatballs looked, even before I read your post. WOW!!! I am DEFINITELY going to make your spaghetti and meatballs recipe this coming weekend! It sounds insanely delicious! And your photography is incredible, Marc!! that makes me seriously hungry for meatballs! Marc, found your site on foodgawker. I think I could make your non recipes often because they seem loaded with flavor that didn’t come from a slab of butter or an urn of sugar. Green food we want to eat. Love the food attitude too. Meatballs look great! The combination of pork and beef really adds to the flavor. For super tender meatballs, I usually add bit of veal as well. Plus fresh bread crumbs not dried, makes a huge difference. BTW KJ is supposed to be posting the Fish and Corn Pudding recipe – can’t wait! Love your tips for making great meatballs. It’s easy to see why it ranks as one of your favorite dishes. You should definitely make it more often! I think that sometimes we neglect making our favorite dishes, because we take them for granted; they’ll always be there after our latest failure or triumph in the kitchen. Of course, once you make them it’s like reuniting with an old friend (didn’t mean for this to come out sappy). 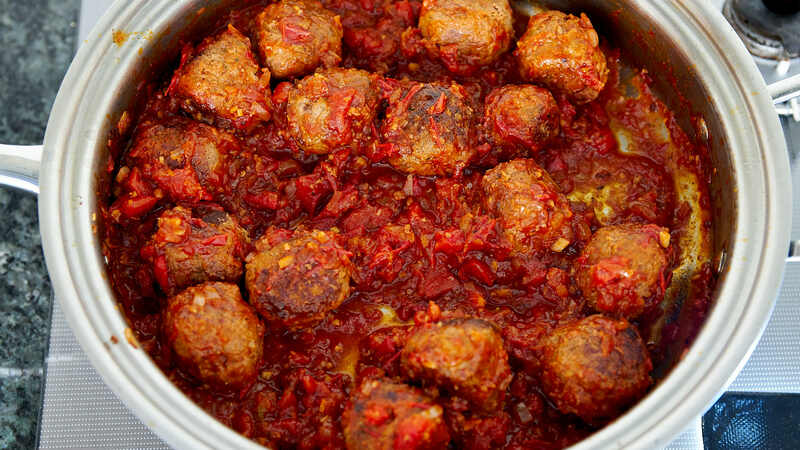 Love the idea of adding ricotta to the meatballs….brilliant! Drooling Marc. I have a serious love affair with meatballs. When they are made properly they are, succulent and delicate. Ok, I’m dying. This looks wonderful, I’m already convinced the flavors are rich. I do keep wondering often through, and this goes for any recipes that combine two or more different kind of meat. Is it the difference in flavor of meat ( in this case ground pork and beef) that makes the dish better tasting? Sometimes cooking different kind of meat in once dish makes me think that it wouldn’t be good for digestion. I should mention though that I am absolutely tempted to try this out. Marc, does your blog site have a print option that I’m not finding? Nope sorry, it’s been a requested feature, but making a print option is a little more complicated than it sounds because I have to go back and change the format of 600 recipes. For now, your best bet is to cut and paste the recipe into Notepad or Word. I just found a plugin that automatically formats the post for printing. There should now be a print button at the top right of every post. That’s a great idea! I often add yamaimo to okonomiyaki and even bread to add more moisture, so I imagine it would work pretty well in meatballs as well. I made this for a recipe swap, it was fantastic. Thanks! Did you disable the plugin? I’m not seeing the button anywhere on the page. Add some tomato sauce to the sauce recipe plus basil and oregano. It doesn’t taste Italian otherwise. I just took a look at the back of a package of pasta and it says a “serving size” is 60 grams of dry uncooked pasta, so just multiply it by the number of people you want to feed taking into account the peoples appetites (make more if they eat more than the average person, less if they eat less). Marc, these meatballs are ridiculous. And if you hide some anchovy fillets in the tomato sauce you end up with something special. Does the mixture make the meatballs moist! This recipe is the best! I did not have any ricotta on hand, so I substituted with tofu (squeezed in a cheesecloth to get all the water out) but it still turned out amazing! The whole family loved it, the kids especially. Thanks Marc! I love all the recipes I have tried on your site. Is it possible to use canned tomatoes? Hi doerp, yes absolutely. One 28 ounce can should be enough.